There are 4 Memory Care Facilities in the West Columbia area, with 2 in West Columbia and 2 nearby. The average cost of memory care in West Columbia is $4,525 per month. This is lower than the national median of $4,650. Cheaper nearby regions include Lexington with an average starting cost of $3,540. To help you with your search, browse the 5 reviews below for memory care facilities in West Columbia. On average, consumers rate memory care in West Columbia 4.6 out of 5 stars. Caring.com has helped thousands of families find high-quality senior care. To speak with one of our Family Advisors about memory care options and costs in West Columbia, call (855) 863-8283. West Columbia sits directly across the river from downtown Columbia, South Carolina, and has a population of 17,000 residents, 18 percent of whom are 65 years or older. For seniors in West Columbia who have Alzheimer's disease and other forms of dementia, there are two memory care facilities in the city, plus two more just outside of town. In West Columbia, as in all of South Carolina, memory care facilities are referred to as Alzheimer's special care units (SCUs) or programs, and they exist as self-contained divisions of larger assisted living centers. West Columbia's four-season climate with hot summers, mild winters and gorgeous falls and springs make it ideal for memory care residents who enjoy spending time outside for supervised recreation. While July and August can be sweltering, the city rarely gets snow accumulation, and its residents enjoy 220 days of sunshine per year. Memory care residents on a budget will find living costs in West Columbia much lower than in most places. The city's overall cost of living is 10 percent lower than the U.S. average, and housing in West Columbia is more than 30 percent cheaper than in a typical U.S. city, perhaps making it feasible for family members to purchase a second home near their loved one. 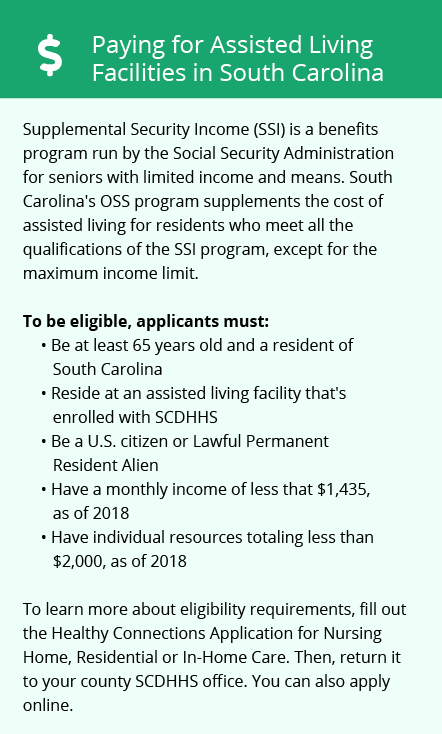 Seniors in South Carolina enjoy some of the most favorable tax treatment in the entire country. Social Security income is not taxed in the state, and seniors earning other forms of retirement income receive a $15,000 tax deduction. Family members considering purchasing a home in the area will be happy to know that the state's property taxes are among the nation's lowest. Safety-conscious seniors and their families should be aware of potential crime issues in West Columbia. The city's violent crime rate is 83.3, compared to the national average of 31.1. That said, memory care facilities, most of which are fortified with secure entrances, guards and cameras, are among the safest places a person can live. Memory Care costs in West Columbia start around $4,525 per month on average, while the nationwide average cost of memory care is $4,799 per month. It’s important to note that memory care rates in West Columbia and the surrounding suburbs can vary widely based on factors such as location, the level of care needed, apartment size and the types of amenities offered at each community. 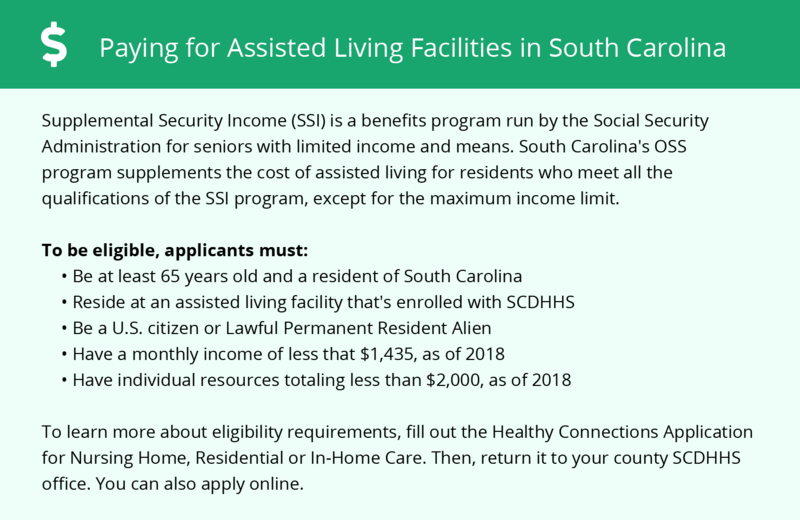 West Columbia and the surrounding area are home to numerous government agencies and non-profit organizations offering help for seniors searching for or currently residing in an assisted living community. These organizations can also provide assistance in a number of other eldercare services such as geriatric care management, elder law advice, estate planning, finding home care and health and wellness programs. To see a list of free memory care resources in West Columbia, please visit our Assisted Living in South Carolina page. West Columbia-area assisted living communities must adhere to the comprehensive set of state laws and regulations that all assisted living communities in South Carolina are required to follow. Visit our Memory Care in South Carolina page for more information about these laws.